Back view of happy girl running towards river embankment, jumping, raising arms excited in New York City slow motion. Portrait of happy excited tourist girl with flying hair enjoying New York skyline view from a tour boat slow motion. Excited Caucasian male tourist making a smartphone video of New York City skyline view on a tour boat trip slow motion. Happy excited tourist man smiling, enjoying Manhattan Island skyline view in New York from a tour boat slow motion. Handsome excited traveler man with arms wide open enjoying amazing New York skyline on a river tour boat slow motion. 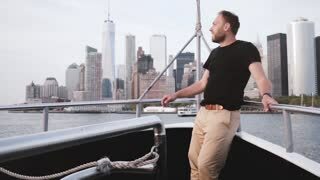 Excited Caucasian male freelancer smiling, enjoying New York City sunset skyline view on a tour boat trip slow motion.